Quantitative precipitation forecasting (QPF) continues to be a significant challenge in operational forecasting, particularly in regions susceptible to extreme precipitation events. St. John’s, Newfoundland, Canada (CYYT), is affected frequently by such events, particularly in the cool season (October–April). The 50 median events in the extreme (>33.78 mm during a 48-h period) precipitation event category are selected for further analysis. A manual synoptic typing is performed on these 50 events, using two separate methodologies to partition events. The first method utilizes a Lagrangian backward air parcel trajectory analysis and the second method utilizes the evolution of dynamically relevant variables, including 1000–700-hPa horizontal temperature advection, 1000–700-hPa (vector) geostrophic frontogenesis, and 700–400-hPa absolute vorticity advection. Utilizing the first partitioning method, it is found that south cases are characterized by a strong anticyclone downstream of St. John’s, southwest events are synoptically similar to the overall extreme composite and are marked by a strong cyclone that develops in the Gulf of Mexico, while west events are characterized by a weak Alberta clipper system that intensifies rapidly upon reaching the Atlantic Ocean. The second partitioning method suggests that while cyclone events are dominated by the presence of a rapidly developing cyclone moving northeastward toward St. John’s, frontal events are characterized by the presence of a strong downstream anticyclone and deformation zone at St. John’s. 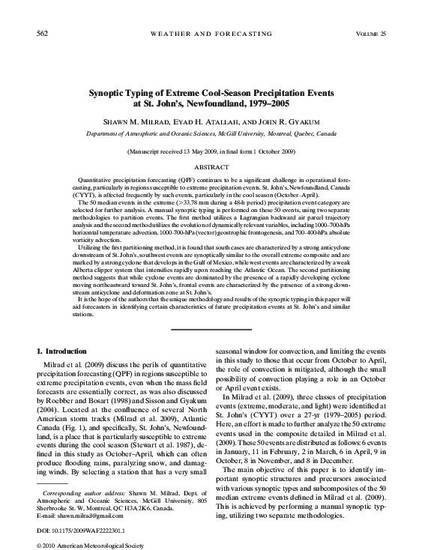 It is the hope of the authors that the unique methodology and results of the synoptic typing in this paper will aid forecasters in identifying certain characteristics of future precipitation events at St. John’s and similar stations.